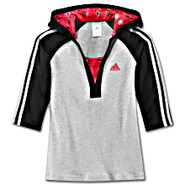 Adidas - Sure to be her new fleece favorite. 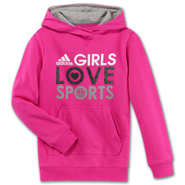 The adidas Core Full-Zip Hoodie is a great everyday choice for your girl. 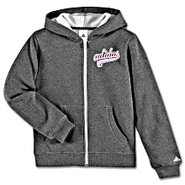 With a cute contrasting-color zipper and glittery adidas word print. 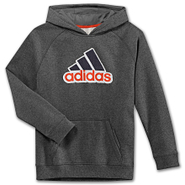 Adidas - For the young sport legend in the making the adidas Novelty Fleece Hoodie features a large sport graphic print along with the 3-Stripes and a roomy kangaroo pocket. 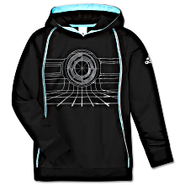 Adidas - When it's not quite cold but you still want to rock a hoodie reach for this adidas Spirit Three-Quarter Hoodie. 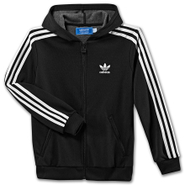 It has stylish three-quarter sleeves a fun graphic on the inside hood and the iconic 3-Stripes down the sleeves. 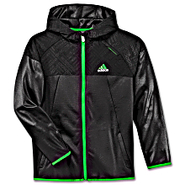 Adidas - A clean and simple new look the adidas Action Jacket is a track top a hoodie and a jacket all rolled into one. This versatile zip-up has two handy front pockets and a subtle textured overlay on the hood chest and shoulders. Adidas - Inspired by an authentic adidas track jacket made famous in the '80s the adicolor Hooded Flock Track Top has a modern fitted look. The vibrant color combinations of this kids' hoodie bring a fresh new feel to an everyday basic. 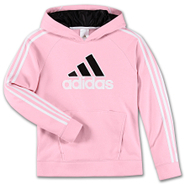 Adidas - The modern hoodie for your adidas girl. 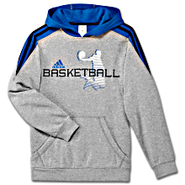 The adidas Logo Hoodie is a cute pullover with a dazzle-print-lined hood. A handy front kangaroo pocket lets her take her tunes along.